This exhibition of works by David Ostrem are all about idea - they range from the early 1980’s silkscreens like Orange Wall and Bo Diddley (Works Festival poster image!) through his skillful pencil crayon drawings depicting art and life as seen through his eyes and the magazines and newspapers he has been reading to the lyrical and humorful Wink and Vue canvases that allude to girlie magazines and other collected publications. Beckett’s artistic explorations have involved the representation of the unseen but felt powers and influences in our daily lives. The process of delving into the depiction of unseen communication has led him to the discovery of time as a subject. This exhibit features Beckett’s three-dimensional work. Frederick McDonald's work is a mixture of styles and expressions; allowing him greater opportunity to have a discourse within many segments of the Canadian mosaic. He uses colours and symbols to capture the experiences, the characteristics and the spirituality of his people. The artists of Molior come from various disciplinary backgrounds; music, poetry, cinema, contemporary and acrobatic dance. Their works reveal a common device: they involve a gesture, act or motion on the visitor’s or viewer’s part, this device serves and furthers their narrative. David Ostream, (curator Gordon Snyder,) “Art as Idea,” Stanley A. Milner Public Library, #7 Sir Winston Churchill Square. Edward Beckett, “A Question of Time,” The Fairmont Hotel Macdonald, 10065 100 Street. Glenn Guillet, “Proposals Done and Not Done,” Edmonton Journal Building, 10006 101 Street. Sharon Hjartarson, “nest insights,” Scotia Place, 10050 Jasper Avenue. Carol Jane Campbell, “Glass – A Show About Sculpture,” Scotia Place, 10060 Jasper Avenue. Edward Beckett, “ A Question of Time,” Scotia Place. ManWoman, “Homesick for Eternity,” Commerce Place, 10155 102 Street. Lylian Klimek, “What If?” Commerce Place. Daniel Robinson, “Fantasy and Light,” Icon Hair Architexture, Commerce Place. Fredrick McDonald, “The Colour of My People,” Commerce Place. Dawn Saunders-Dahl, “Mnemonics,” Manulife Place, 10180 101 Street. Tim Rechner and Craig Talbot, “Automat-isms,” Manasc Isaac Architects, 10225 100 Avenue. Richard Tosczak, “Roda de Capoeira,” Manasc Isaac Architects. Jo Ludwig, “Things of Beauty,” Bank of Montreal, 10199 101 Street. Dan Bagan, Tom Gale, and Gordon Harper, Rigoletto’s Café, 10068 108 Street. Adam Rankin and Shannon Collis, “Keep the Wound Green,” Flybar, 10314 104 Street. Philip Jagger, “Cyberoptixx,” Naked Cyber Café and Espresso Bar, 10354 Jasper Avenue. Eli Bornowsky, “Borzle Ched,” Naked Cyber Café and Espresso Bar. Works to Work artists , “The Works Project,” Lila’s Coffee House, 10153 97 Street. Edmonton Public Schools, “Best of High School Portfolio Award Exhibit,” Kids in the Hall Bistro, City Hall, #1 Sir Winston Churchill Square. The Works, “Snapshots of Your Environment,” City Hall. The Edmonton Art Gallery, curators Catherine Crowston and Diana Sherlock, “The Alberta Biennial of Contemporary Art,” #2 Sir Winston Churchill Square. Unversity of Alberta, Industrial Design Graduates, “Ideation,” Winspear Centre, #4 Sir Winston Churchill Square. Emily Carr Institute of Art and Design, “Print Artists from the Emily Carr Institute of Art and Design,” Citadel Theatre, 9828 101A Avenue. Art of CAD 2002, Stanley A. Milner Library, #7 Sir Winston Churchill Square. Malaspina Print Artists, John Graham and Jude Griebel, “Interior Play,” Stanley A. Milner Public Library. Yukon Art Centre, “South of 60,” Grant MacEwan College, 10700 104 Avenue. Le Groupe Molior Inc., Francoise Lavoie Pilote, Eveline Le Calvez, and Neam Cathode, “Quebec New Media Artists @ The Works,” Edmonton City Centre East. Society of Northern Alberta Print Artists (SNAP), The Great West Saddlery Building. Latitude 53 Gallery, Marcel Dzama, “Even More Famous Drawings,” The Great West Saddlery Building. Red Deer College, “Visual Art Students Exhibition,” Manasc Isaac Architects. M.A.D.E. in Edmonton, “Kids Draw Furniture,” Manasc Isaac Architects. Alberta Craft Council, “Craft or Art?” 10186 106 Street. Snapshots High School Photography Competition, “Snapshots of Your Environment,” City Hall. Peter Field and Memi von Gaza, “Celebrate Canada Day Lantern-making Workshops,” City Hall. University of Alberta, “Bodily Pleasures,” “Surface and Mettle,” Fine Art Building (FAB) Gallery, 112 Street and 89 Avenue. University of Alberta Hospital, “Visions of Wellness,” McMullen Gallery, 8440 112 Street. 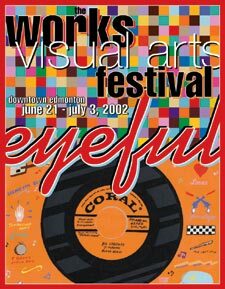 Centre d’arts visuels de l’Alberta (CAVA), Herman Poulin, Madeleine Bellmond, Claude Theriault, and Laurette Goudreau, “Gathering of Art;” 8627 91 Street “Jazz’Art Concert,” Fly Bar, 10314 104 Street. The Paint Spot, “Whyte Avenue Art Walk 7,” 10516 82 Avenue. Harcourt House Gallery, “Naked Number Ten: X Rated,” “One Size Fits All: The 14th annual members show of the WECAN Society,” 10215 112 Street. The Ancestors, “A Multi Experimental Extravaganza,” Fly Bar. Boreal Electroacoustic Music Society (BEAMS) Concert, Fly Bar.